First of all, a warm welcome to Yumi Watanabe-Patterson, the new cheer coach for Estancia High School. We featured both Costa Mesa High School’s Cheer Coach Kori Johnson and Estancia’s new Cheer Coach Yumi in a recent blog. 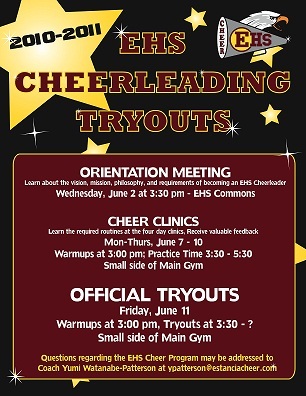 It’s time to gear up for a new season of Estancia High Cheer! Tryouts will be held on June 11. Let’s hear it for the Eagles!